June 3, 2016—-Now that nice weather is upon us, many think about taking tents and equipment into the peacefulness of the wilderness, sitting by a stream with a fishing pole, hiking the path along the scenic terrain and getting out of the city into nature. Replace Those Batteries with Sun Power! Know the weather when your camping. 1. 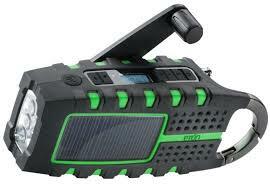 Eton Scorpion Multi-Purpose Solar Powered Digital Weather Radio–It retails for about $70. It’s a flashlight, radio, USB cell phone charger, and gives you weather alerts. Reviews say it’s good for short interval uses. Charge phone as you boil water. 2. 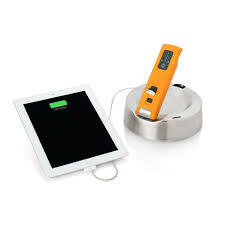 Biolite KettleCharger–This gadget charges your phone or tablet while you boil water. It retails for about $150 from http://www.BioLite.com and provides 10W On-Demand power, with a charge the strength of a wall outlet. It also stores power for “a quick recharge with no heat or water.” This gadget packs flat, creating power while you boil water for cooking, drinking or cleaning. You can use it on your camp stove, boiling water as your battery stores power. This has excellent reviews. Solar Lantern that is waterproof. 3. LuminaAid Packlight Spectra–This is a color changing solar light that inflates into a handy lantern and retails at Luminaid.com for about $25. It recharges in about 7 hours direct sunlight and gives 12 hours of LED light. It weights about 3.5 oz and is waterproof up to 1 meter deep and can float. This has excellent reviews. 4. GoSun Stove–This retails for about $280. 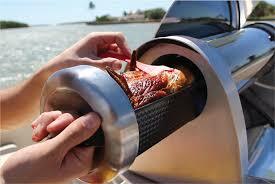 It’s a portable stove that cooks a meal in less than 20 minutes and uses no fuel, only the sun! It weighs about 3.5 pds (1.5 kg), but will cook up to 31 lbs of food at a time. It retains about 80% of it’s sun intake, can bake, boil or fry and collapses to carry. This has excellent reviews. 5. 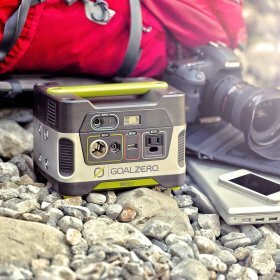 Goal Zero Yeti 150 Solar Generator–Available at http://www.REI.com for about $230. It’s gas free and fume free, cranking out portable power from sunlight to power lights, phones and laptops. It’s quiet and lasts about 7 hrs on a full charge. The output is 12V, AC, and USB. It weighs about 12 lbs and is rechargeable by solar, AC or 12V. It can be plugged into a Boulder 30 panel for recharging. Wash your clothes when camping! 6. Scrubba Wash Bag–Pick it up at REI for around $50. It weighs less than 5 oz, volume of the bag is about 3 gallons. You fill it with water, clothes and soap, your rub it with your hands to wash. 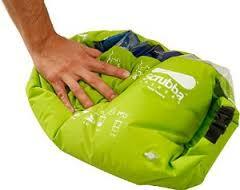 Inside it has hundreds of internal Scrubba nodules that clean your clothes quickly and it folds down to pocket size. It has a transparent window so you can see the dirt escaping your clothes! And you can just keep dirty clothes in it until your ready to do your wash. This has very good reviews. These are just a very few of the many renewable accessories available for camping–and you can’t beat a free charge using the sun! Have a fun summer! And remember—do what you can, when you can, where you can to create a healthier planet! Categories: Building Green, Climate Change, Renewable Resources, Solar, Sustainable Education | Tags: Renewable Resources, Solar power, Sustainable energy | Permalink.